Taking horse racing photos can be very rewarding. 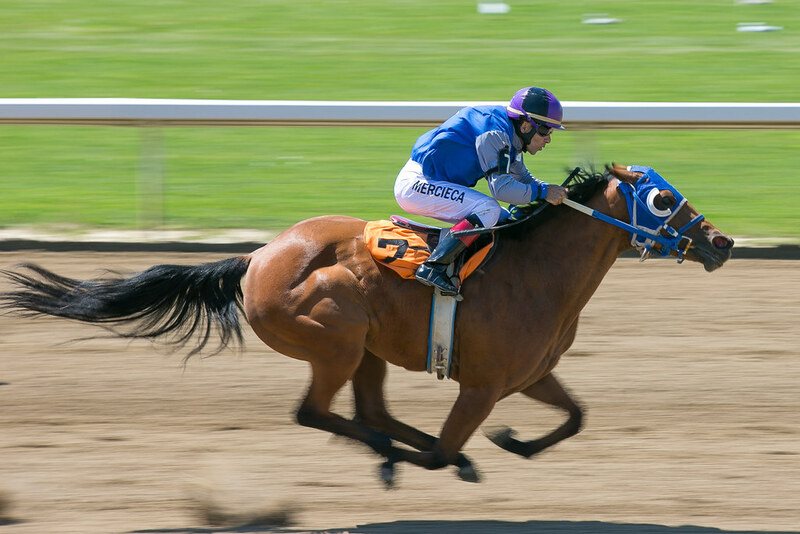 The fast paced action of horses in motion frozen in time can often show things you miss during the race. For beginners, even advanced users, freezing the frame isn’t as easy as it sounds. Horse shows and events? Taking photos at a horse show or event? Read more tips on taking pictures at The Royal Winter Fair. Click here for more tips! What camera gear do I bring? For every horse racing or equestrian event I bring this! SEE WHAT'S IN MY BAG! The number one thing to remember about horse racing is speed. Check out my sports photo tip for the simplest thing you can do to improve your photos. These horses move extremely fast and freezing that action is what it’s all about (well at first it is). So how do you go about doing this? I have three tips for taking consistently good horse racing photos. Use shutter speed priority – All DSLR’s made over the past 10 years have a shutter speed priority mode. You may have to dig up the manual for your specific model. Canon shutter speed setting is Tv on the dial (except for cameras like the Canon 1DX where there is no dial). For Nikon use S. Once you have this set you’ll need to set the shutter speed to a minimum of 1/800. Often I shoot at 1/1250 or higher. This will freeze the action every time. Anything lower and you’ll introduce blur from the action and your camera movement. So, as a starting point switch to shutter speed priority at 1/800 or higher. ISO – This setting basically controls the graininess of the photo. The lower the number the better the less grainy the picture will be. On a sunny day you can easily shoot at ISO 100 or ISO 200. But what about overcast days or evening races? Well this all depends on your camera. Some cameras can shoot at insanely high ISO settings and still obtain crisp photos. You’ll simply have to push your cameras limits and accept the outcome. Unfortunately this is where spending more money really matters. However, for most newer DSLR’s you can easily push to 800 ISO without an issue. Aperture setting – This is the depth of field setting and what creates the blur in a photo. Ideally it’s best to have a shallow depth of field so that the subject that is in focus pops out. However, in horse racing this can be very tricky. The amount of time you have to focus on any one horse until the pass by you (hopefully at the finish line) is a matter of seconds. The race can seem long but that time the horses are racing by you is all but a blink of the eye. So, when trying to lock your focus in on the right horse can be next to impossible. Having an aperture setting of f2.8 or f3.5 can give you great blur and depth of field but if you’re focused on the fence everything will be blurry. The best thing here is to practice until you get it right. Adjust the aperture to a point where you feel comfortable with capturing both a focused picture as well one that pops out. Examples of indoor and outdoor equestrian photos CLICK HERE! You can see some examples of my horse racing photos to get a feel on how different camera settings impact the photo. Let’s face it tips are tips and can be used in so many photographic situations. Take wildlife photography for example. It’s almost the same as horse racing, speed, unpredictable, long lens etc..